At the University of Redlands, Geography Awareness Week (GeoWeek) 2018 featured an array of events—from a showcase of student-led GIS projects to a humanitarian mapathon—all of which underlined the importance of place and celebrated spatial studies at the University. An annual observance established by President Ronald Reagan in 1988, GeoWeek kicked off at the U of R on November 12 with Mapping Monday, a weekly seminar hosted by the Center for Spatial Studies. In this session, geographic information systems (GIS) Professor Douglas Flewelling gave a presentation on “ludospatial analysis” in video and board games. On Tuesday, University of Texas at Dallas postdoctoral researcher and GIS expert Christopher Franklin delivered a lecture as part of the Center for Spatial Business Speaker Series. In his presentation, which focused on home improvement retailers, Franklin spoke about how spatial thinking can be used to gain marketing insight by combining time-based and geographic models. 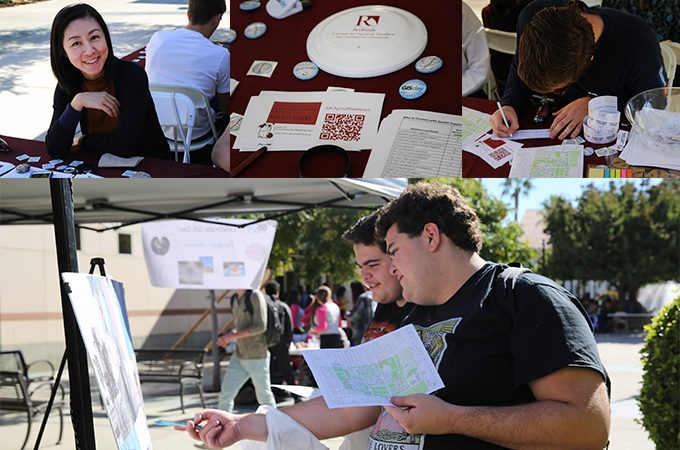 GIS Day on Wednesday featured a showcase of poster displays, technology demonstrations, and hands-on activities in Hunsaker Plaza. People gathered for drone demonstrations, engaged in a campus treasure hunt by using Esri’s ArcGIS software, and entered raffle contests. A Master of Science in GIS colloquium followed, exhibiting numerous graduate student projects and presentations. On Thursday, the newly formed U of R Community Mapping Club, an on campus chapter of Youth Mappers, hosted the fourth annual GeoWeek Mapathon. During the event, participants worked on existing maps hosted and updated through a crowdsourcing process on OpenStreetMap.org, a website that serves as a sort of Wikipedia for mapping. GeoWeek concludes Friday with the Center for Spatial Studies’ annual disc golf tournament, which takes place at the nine-hole disc golf course on campus. The course is located along the southern side of Sylvan Boulevard, east of Anne Peppers Hall. Individuals and teams of four receive custom tournament discs and compete for prizes. Learn more about the Center for Spatial Studies, the Center for Spatial Business, the spatial studies minor, and the MS GIS program at the University of Redlands.